We are passionate and proud about the service we provide you, and your happiness with our superb cleaning, restoration, and conservation services gives us great pleasure. We can make needed repairs for you and also clean and preserve your other special garments such as christening gowns, communion dresses, quinceaera gowns, military uniforms, and other keepsakes. We use Green Technology in our processes and preservation which is safer for you and for our planet - and with our National Services Network, we can serve you throughout the entire United States and North America. Our written international guarantee is honored by Certified Wedding Gown Specialists ® around the world and includes free pressing when your gown is used again. We proudly carry the distinction of endorsement by the Association of Bridal Consultants. Your wedding gown is one of your most precious possessions. It is the symbol of one of the most important events in your life and should be treated with very special care. 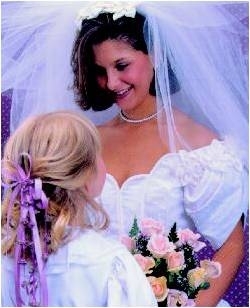 Preserve your wedding gown as a keepsake - perhaps for your own daughter to wear on her wedding day. Cleaning experts recommend that your wedding gown be cleaned by an expert before you store it because the gown may have invisible stains from food, beverages, body oil or make-up. Long gowns and trains typically get soiled from the ground and dance floor, and if these stains on your bridal gown are not properly cleaned, they may become permanent. Once your precious wedding gown is completely clean and pressed with meticulous attention to detail, your wedding gown is carefully placed in an acid--free, lignin-free bridal gown preservation chest which allows the fabric to breathe but protects against damage from light, dust, and mildew. Acid-free tissue cushions each fold of your wedding gown in order to maintain the designer's distinctive line and drape. The wedding gown preservation chest has a window so you can view your gown, and it is closed but not sealed so the fabric can expand and contract with changes in heat and humidity. An outer protection carton is placed over the acid-free chest to further protect your gown from dust and light. As a final step, a quality muslin wedding gown chest cover is placed around the chest. We also enclose a pair of white cotton gloves for you to wear when you handle the gown. Proper storage of your wedding gown heirloom package is a vital step in the preservation process. Store your package in a cool, dry, dark environment-perhaps under a bed or in a closet on a main floor. Attics are too hot, and moisture may be detected in most basements; therefore never store your wedding gown or other treasured family heirlooms where there are extreme changes in heat and humidity. For more information about our Wedding Gown Services, please email or call us. Ensure the beauty of your special gown and safeguard our planet's future. When you choose one of a Certified Wedding Gown Specialists ® to give your beautiful gown the care it deserves, you can also choose to help safeguard the future of our planet. We asked Carbonfund.org, the leading nonprofit provider of carbon offsets and climate solutions, to help us calculate the carbon footprint of the process of cleaning your wedding gown and preserving your wedding gown. We included everything that goes into the process of cleaning and preserving your wedding gown from your trip to and from one of our Certified Wedding Gown Specialists™ to the cleaning procedures to the wedding chest's manufacture. And now for every gown we clean we account for the carbon footprint with our own donation to Carbonfund.org. This small sustainable gesture will go to support global renewable energy, energy efficiency, and reforestation projects that reduce carbon dioxide emission.